Today I’m opening a series of posts about our wedding, that will soon have happened a year ago. Some of you that have been reading this blog for some time or stumbled upon an old post might wonder: “But hasn’t she talked about her husband before March 2012?”. Indeed, I have. This was actually our second wedding. Let me explain something to my non-french readers (or you can skip to dress pictures below ^^ ). In France the only way to be legaly married is to be married at the city hall by the mayor or the mayor’s assistant. Any other ceremony is only for your own satisfaction/beliefs, it won’t be legal. And to be married in a catholic church (for example) your have to arrive that day with an official paper proving that you got legaly married first. It is therefore very common to have two ceremonies, first the legal one (which is rather quick) and then a religious one, usually happening the same day or a few days appart. In our case, the two happened four years and twelve days appart. 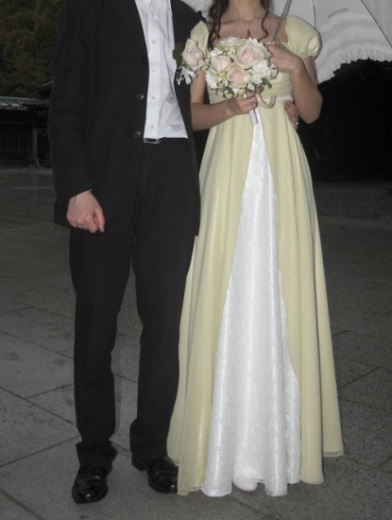 When we got engaged 6 years ago we were living in Japan, so we planned to wait until we got back to France. But at the beginning of 2008 it appeared that we had to get legaly married to be able to realise our plans. 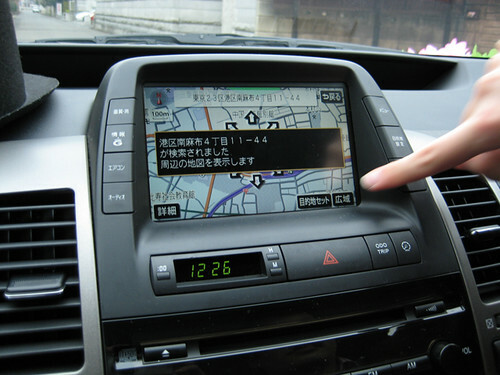 We therefore decided to quicken the legal marriage, which meant preparing it in less than one month, in Japan. You can easily guess that none of our relatives that didn’t live there could attend. So we decided at that time that we would only do a quick official wedding for the papers, and that we would have another “real” wedding with our family and the rest of our friends when we came back. Funny thing is, both of our weddings happened in March (we didn’t plan that). 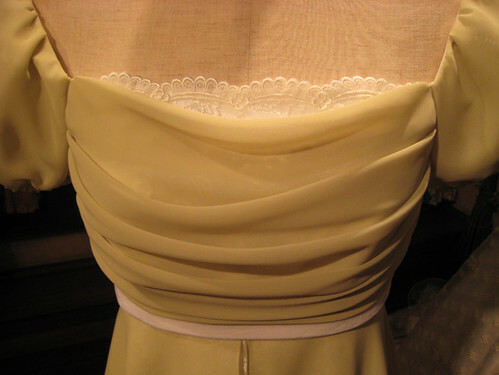 Our legal wedding anniversary was last week, so I thought I’d share pictures of the dress I wore then before talking about the second one. 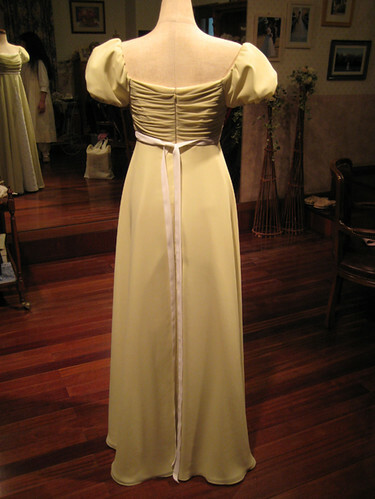 It’s not totally irrelevant to this blog because even though I didn’t make it myself, I did design it and had it made by a professional wedding dress maker. Even though this wedding was at first motivated by administrative necessities, it was the first and only time we were to be legaly united and recognized as husband and wife by the law, so we felt we had to play the part so that we’d feel like getting married (all the more since many close relatives weren’t there): we went for a real french legal wedding at the embassy (instead of just signing wedding papers at the japanese city hall), nice outfits and have a day that we would remember. 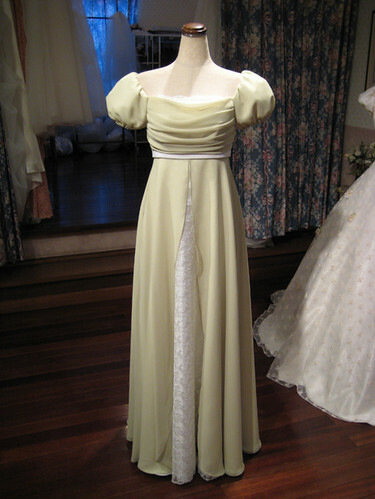 I wanted to keep the traditional big white dress for the french wedding (you’ll see the irony in that sentence with my later posts), especially since at first we thought we would have to go there by train, plus I had a very small budget, so I went looking for an elegant but simple long dress that would be suitable (at that time I didn’t imagine making it myself). And guess what? 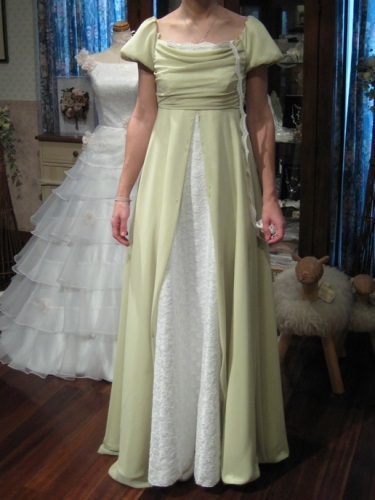 The solution I found within my price range was to have an empire dress made by a designer specialized in wedding dress, that worked two streets appart from my home! She was adorable and very patient, making sure everything was perfect despite her basic English and my poor Japanese. Here is a little glimpse of its creation. 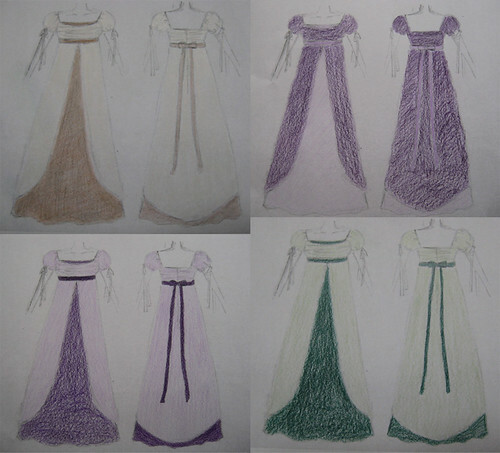 First, my inspiration (in purple and green). 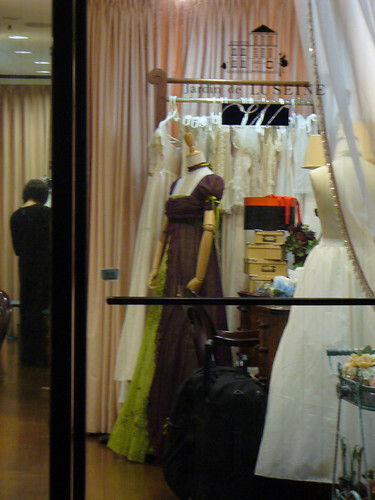 Rental dresses that I saw in a shop window in Harajuku and fell in love with, which a dear friend convinced me to try even though they were way out of my budget. Then my first sketch and some color tests. 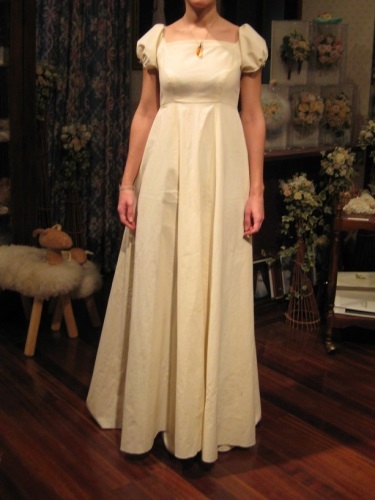 Then she constructed the muslin and we had several fitting sessions before getting to the final dress (the sleeves took some time to get right). 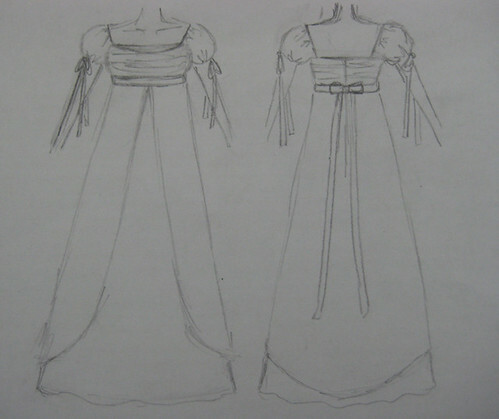 And finally here is the dress all done! With pictures from the D-day taken by our friends. In real like it’s way more green than you can see here. The color is hard to get right on pics and it didn’t help that those are taken with poor lighting. 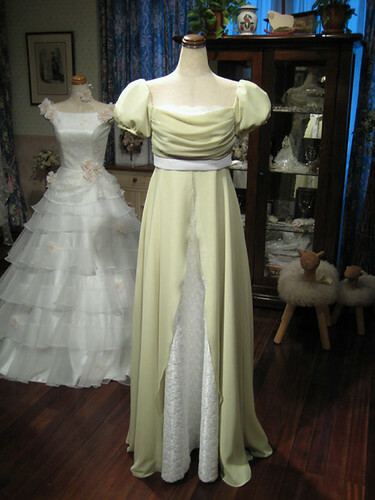 So here was my first wedding dress! ^_^ I had the pleasure to be able to put it back for a few pictures by our official wedding photographer last year, and to wear it for the brunch we did the following day. More to come soon about wedding n°2! I don’t have any sewing to show yet. Not that I’m not sewing, but I do it on an irregular schedule and I find it hard to finish anything… Did my “boulet” skirt bring me bad luck? ^^; I’m not as enthousiastic about my current projects as I’d like now that I see how they will look like in the end, and I don’t have much motivation to work on the little finishing details. But I hope to have something new to share soon! 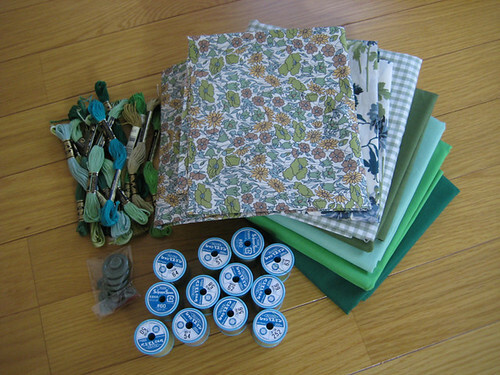 In the meantime I still go on buying new stuff for new projects, mainly sewing magazines. 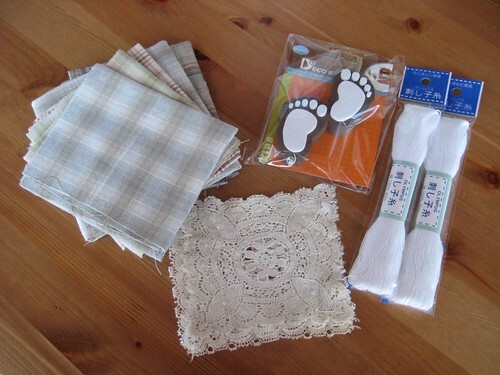 ^^; My husband isn’t so happy about it, and I know I should wait, but what can I do? 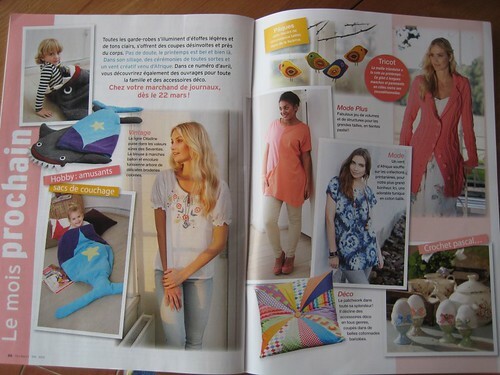 The magazines won’t be for sale forever, and I like looking at inspiring pictures, especially when my own sewing doesn’t go so well. I like dreaming about new projects (which doesn’t help me being more efficient). 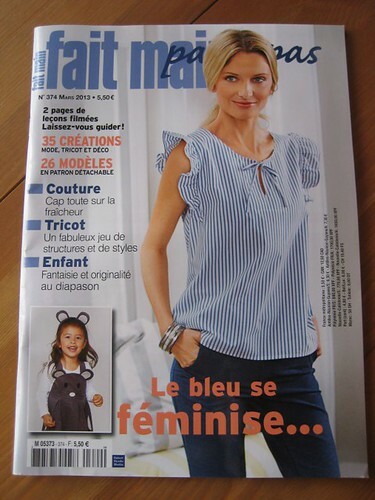 Last week I saw the current “Fait main” (meaning “hand made”) magazine and decided to get it. It’s the first time I’m buying one of those, I thought I’d share the patterns I liked. 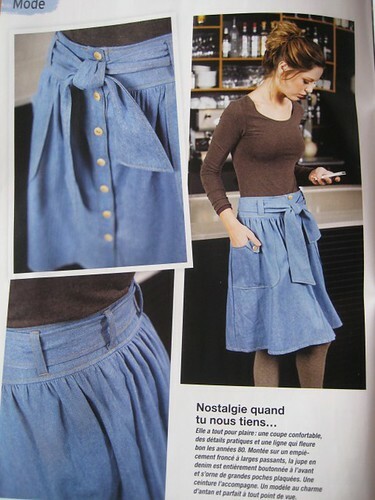 The description says this skirt is inspired by the 80′s. I’m far from being an 80′s fan (come on, I was a child then, most of the clothes were ugly! 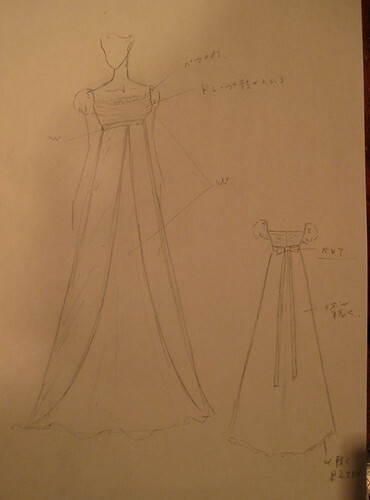 ), but I find the skirt quite nice. I think it could also be made without the buttoned opening down the center, with a zipper at the side (and then look less 80′s). 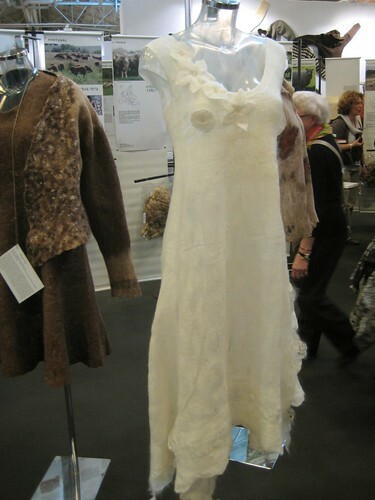 A nice dress with an unusual shape which looks very comfortable (thanks to the knit fabric). I find myself wanting comfy clothes right now, so I like this. For my future children? 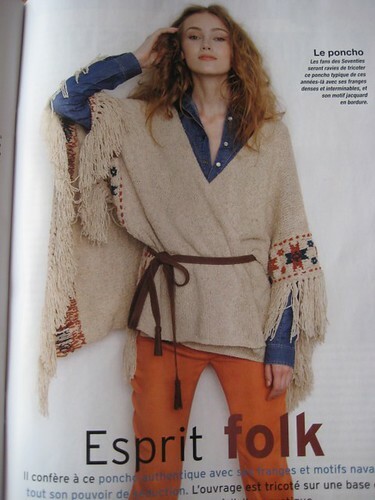 I don’t like the gathered-bottom pants they show with the fox tunic, but the tunic itself is nice. 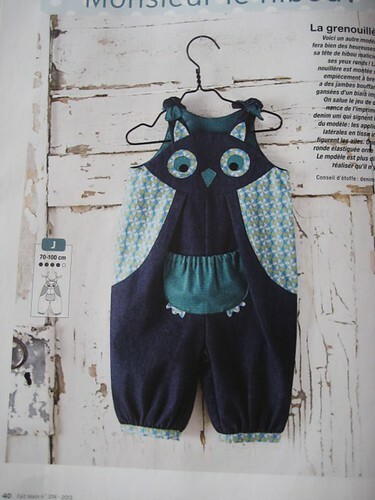 And I really like the mouse dress and owl playsuit. I’m not entirely fan of the cover outfit, but the tunic looks refreshing and the capri pants have some nice details, so who knows? I might make it one day (after I’ve made the ton of others projects I have in mind XD ). The other pieces are somewhere between “I don’t really care” and “mmm, maybe one day”. I’m writing tonight (surrounded by snow, it’s been crazy today, I didn’t have any train to go to work) to tell about a new page I’ve added to the blog. 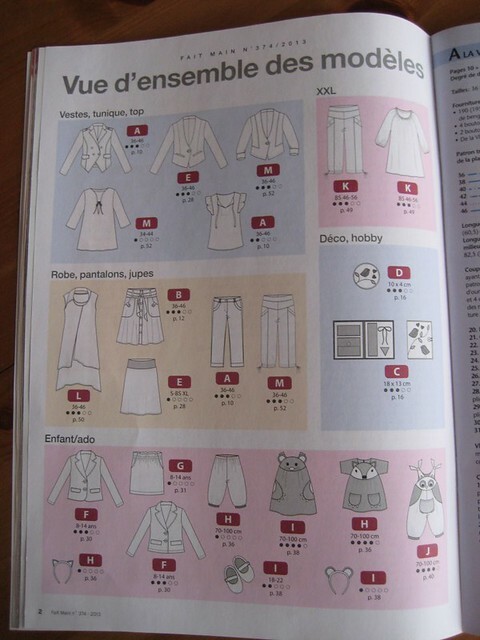 I’ve decided to start a resource list on where to find fabrics and notions online in France or in the neighborhood. 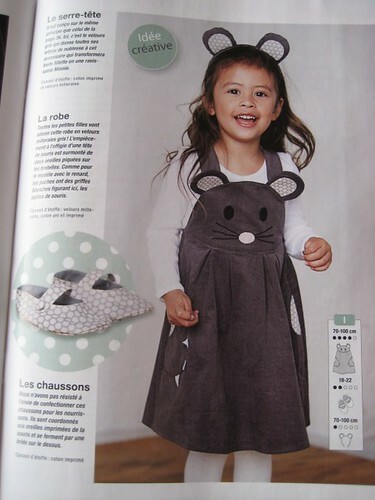 I read a lot of american blogs, and sometimes I feel like I know more online shops in the US (or other far away parts of the world) than in France. ^^; Which is a shame, since I’d like to encourage local shops and creators also. So I decided to keep track of the shops I discover through searches or blogs. It will be good for me to have this list to refer to in the future, and I thought it could be useful to others also, so I’m putting it here! 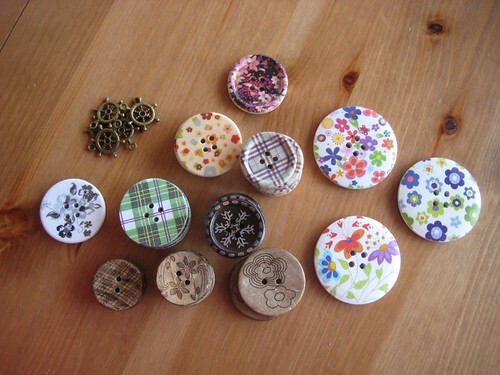 It’s very small at the moment, I hope to regularly add to it. For now the full list will be in the French version, with only selected items in the English version, since most websites are in French. 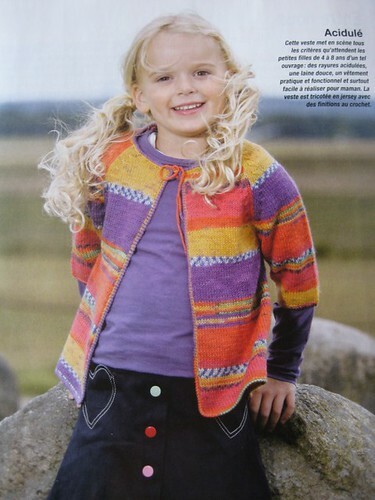 Earlier in February I mentionned L’aiguille en fête, a sewing/knitting event. I went there on Saturday 16th with my mum (it was fun to have a mother-daughter meet-up centered around needlework) and I have to say I had a very nice time. 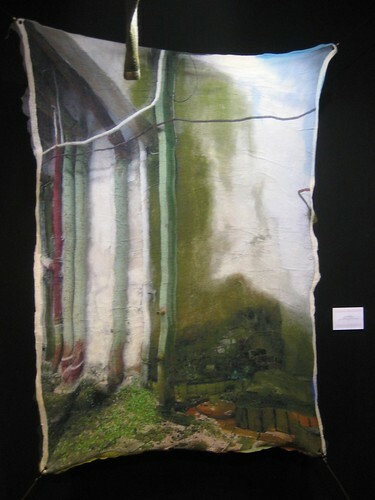 We started with the exhibition part, which ate up a lot of our time, even though the main theme was less interesting to me this year than the previous ones. After that we had to rush a little bit to see the vendors. Next time I should try to go early in the morning. But I still made some nice discoveries, bought a few nice things (my wallet is less happy about that) and overall had a very good time. Here are a few of my favorite memories in pictures, and you can see the rest on my Flickr. 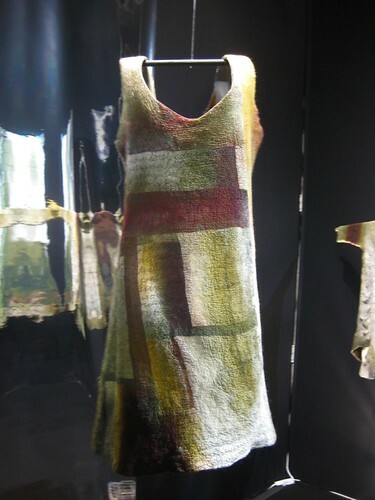 The exhibition theme was “knits”, so they had a big space devoted to wool. 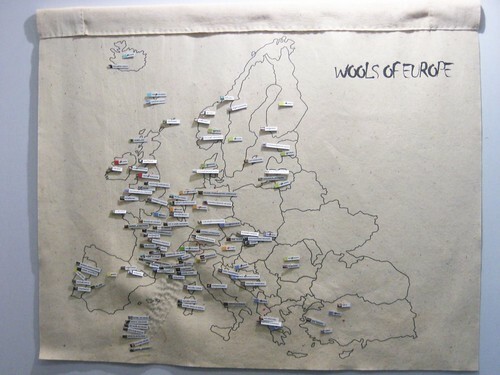 They showed a variety of (unprocessed) wools from different parts of Europe and some projects made of wool (a lot of which made from felted wool). Then they had several smaller spaces devoted to creators. 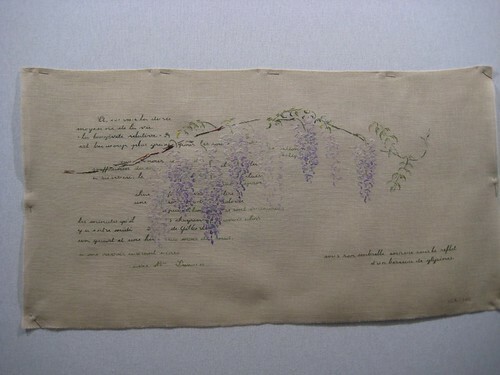 We were completely charmed by the embroidery work of Ms Marie-Therese Saint-Aubin (who seems to have written embroidery pattern books that are quite popular, judging from the comments were heard). 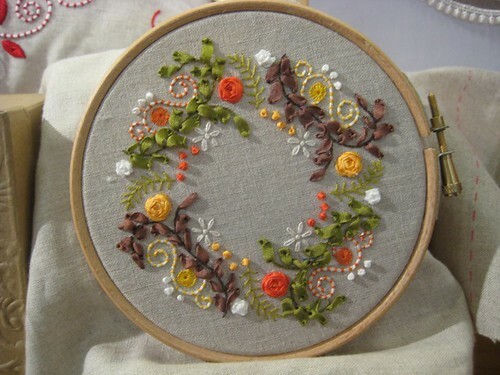 Most of them are cross stitch embroideries. 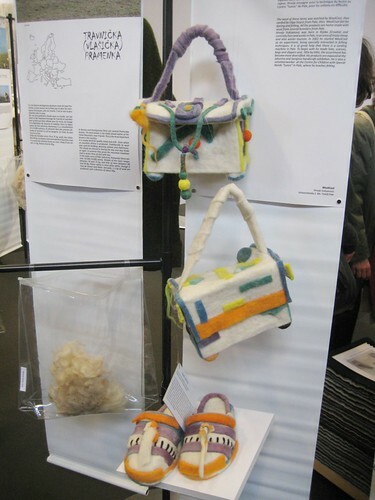 Loot at how delicate her work is! 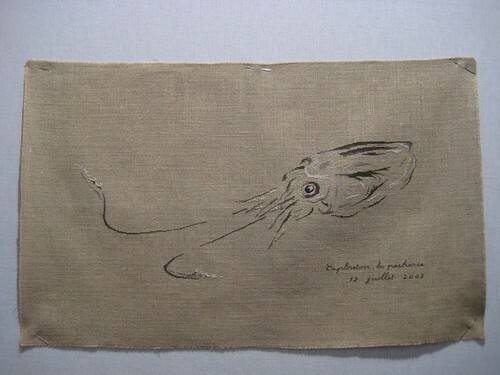 Both the stitches and the created drawings… we were really impressed. And on top of that, that lady is very nice and willing to answer questions and explain her technique. 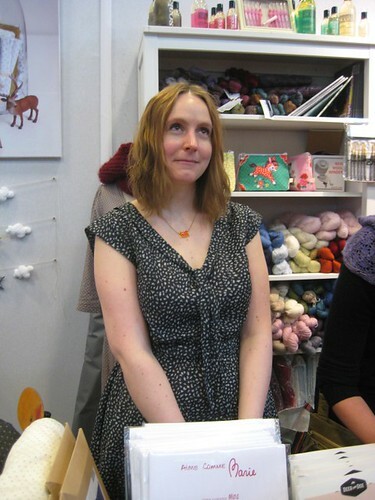 The charming Eleonore, designer of the Deer and Doe patterns (and creator of the Thread & Needles French sewing/knitting community). 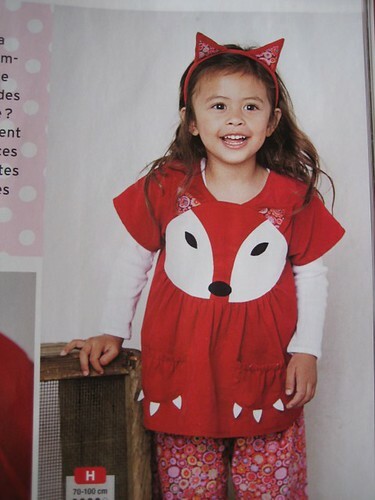 We talked a tiny bit about the next patterns, to come early April (we can’t tell much about it, but with the small bits I know I’m sure the next collection will be great!). I can’t wait! 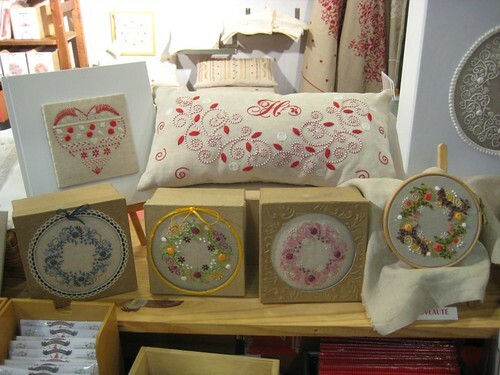 Embroideries that immediatly caught my eye on the Rouge du Rhin booth. I even got one of their designs. 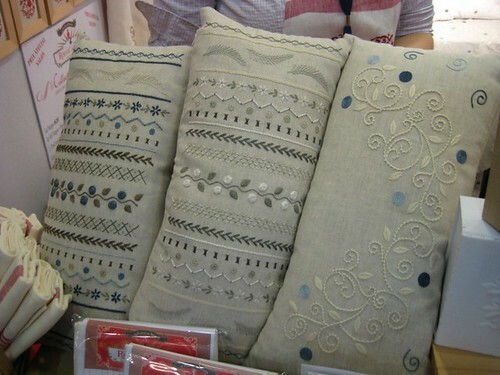 One of the ladies who owned the booth kindly showed us how to make the embroidery stitch that you can see on the white and blue cushion on the right of the first picture. We didn’t know it and I really loved how it looks. 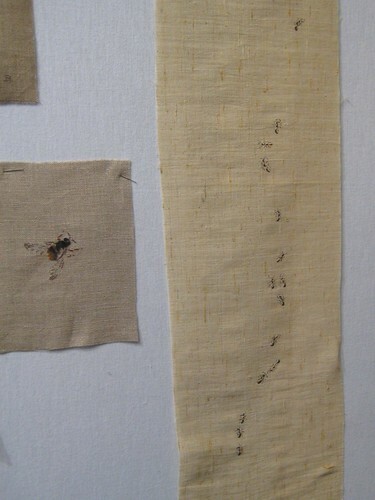 It’s call Palestrina stitch. I also like the two-tone Boulogne stitch very much. You can see it in red and white at the top center of the second picture. Doesn’t it remind you of Tim Burton’s work? Of course both of those stitches are on the pattern I got! And now let’s talk about what I brought back. I wasn’t really reasonable, especially since this year I mainly got patterns and kits, which are more expensive. Let’s start with those. 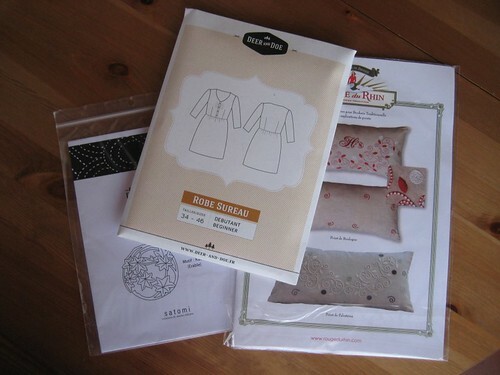 Patterns: the cushions embroidery pattern, the Sureau dress by Deer and Doe and a sashiko embroidery motif. 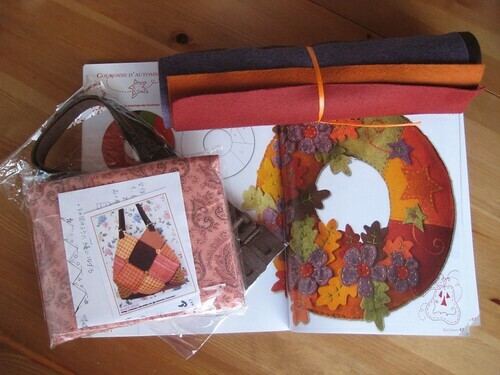 Kits: a kit for a patchwork bag that I completely fell in love with, and a magazine + felt kit to make a cute autumn crown. I’ve been thinking about getting that last one for the past years, so this time I decided to just do it. Now I “just” have to find the time to use all this! At leat I didn’t bring back big fabric cuts that would pile up on what I already have. ^^; And as I said at the top of this post, you can find all the pictures I took on the devoted Flickr set, I took about a hundred of them.